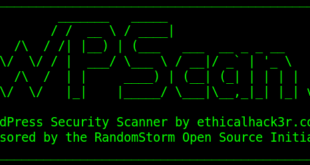 WPScan is a black box WordPress Security Scanner written in Ruby which attempts to find known security weaknesses within WordPress installations. Its intended use it to be for security professionals or WordPress administrators to asses the security posture of their WordPress installations. The code base is Open Source and licensed under the GPLv3.